Last week we got a little tease that there would be some new trailers for Halo 5: Guardians, that would show off a little more of the story. Well last night, two new trailers were revealed. One was for Master Chief and one was for Spartan Locke. Check them both out below. One thing to notice from them. In Master Chiefs video, Locke appears on the Chiefs radar as a friendly, but in Lockes video the Chief doesn’t show at all. Now, this could mean that he’s being seen as an enemy, and when enemies don’t move they don’t show up on radar where as friendlies always show up. Could this mean anything? The trailers don’t really reveal that much, which has now caused a lot of people to start speculating what they could mean. I’m OK with the little snippet, I’d rather they kept some secrecy around the story. However, they do reveal one pretty important thing, the release date. 27.10.15. Get that in your diaries, get the day booked off of work, just get ready. There was one more piece of Halo info released last night, and that was the 2nd episode of the audio log from the #HUNTtheTRUTH blog, which tells the story of Benjamin Giruad as he investigates the Master Chief. 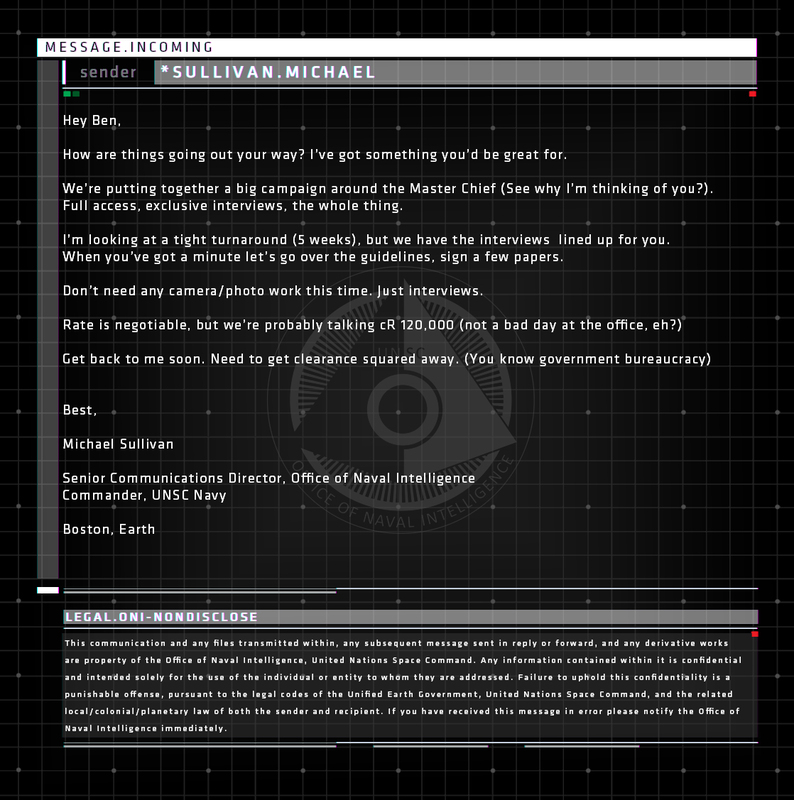 There was also an accompanying email to go with the post from an ONI officer named Michael, saying that he’d set up interviews for Benjamin. Are these interviews people who actually knew John, or just plants? After all, Master Chiefs childhood is very much shrouded in mystery. Email from ONI officer setting up meetings. A Hairline Fracture delves a little further in to the history of the Chief and his growing up on Erindanus II in Elysium City. As mentioned we get to hear from some of the people who knew him as a child, including Ellie Bloom who he found via some of his old sources. She talks about how she used to lie in the long grass with John – which is clearly talking about this trailer. Quite frankly, all of this has got me very excited about Halo 5. So far they’re doing a great job of marketing this game. Check out the audio log here.